If your recently bought new battery is empty after 3 days in the garage there is something wrong , so it is time to measure your quiescent current. For the newer models you can't do this with just disconnecting the ground cable and put the Ampere-meter in between as with the old models. If you do so, you will lost all the parameters (time, steering angle sensors, failure codes are gone) (see DC-Arbeitsanleitungen: AR00.19-P-0200P and AR54.10-P-1030-03P). Because of the battery can't just be disconnected, use a second separate 12 Volt- Battery that has been connected to the posts. Attention : Connect plus of the second Battery to plus of the first one. Ground to the grounding point on the chassis. Use lower gage size cable in order to use them as a fuse in case you have made a mistake. Now you can disconnect the Ground wire at the battery pole. Put an Ampere meter in between and disconnected the secondary battery. Now the Central locking uses approx. 20 A for initialising and after some minutes (wake up time for the control units) it should only be 0,035 A . After you have finished your measurements, you have to put in the secondary battery again, just to make sure you don't loose the parameters described above. Ignition on :3 A Ignition off 1,8 A, after 10 sec 0,4 A. (car locked automatically ), after 2 Minutes 0,13A, after 30 Minutes 0,03A. Every cable has a small resistance, where you can measure a voltage drop if current flows. . Normally a Voltage measurement on both ends of the Ground cable will allow you to determine a Voltage drop. 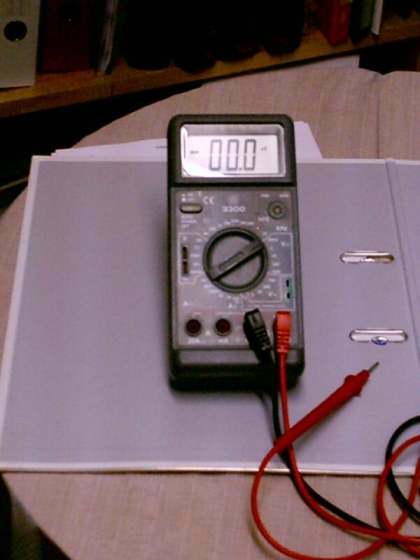 Also a Ampere meter can be connected parallel to the ground cable . So interesting parameters are measured. Measuring the Quiescent current directly : Battery stays connected. After some minutes at locked doors the values are reduced to 4 µA, then to 1µA. (last value is equal a current of 0,03A in the ground cable. So you can control, without any expensive measurement Units , the function of the Generator when Engine is idle. : The current flow is negative : the battery is being charged . for instance : the command 2.0 Multimedia Interface has been connected to Battery plus and not to ignition , so it was always active and had a quiescent current of 1 A. After a period of 3 day the battery has been discharged completely.